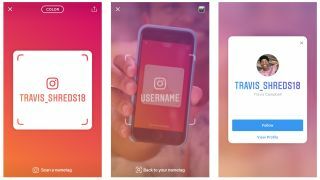 Instagram is rolling out a new feature that makes it easier to find and follow the accounts of people you meet in real life. Nametags work much like QR codes, displaying your username in a way that can be scanned by someone else's phone, and can be customized with colors, emoji, selfies and stickers. The feature is available for both Android and iOS. To use it, tap the profile button at the bottom right of the app, then tap the menu button and select the preview image. To read someone else's tag, open your own and tap the 'Scan a nametag' button at the bottom. Not going to be seeing a friend face-to-face? You can also send your Nametag via a text message, WhatsApp or Facebook. Tap the arrow at the top right of your tab to give it a try. Instagram is also testing a new feature for connecting college students and recent graduates. Harking back to parent company Facebook's beginnings as a social network for students, Instagram School Communities invites you to enter the name of your college, along with your major and any interests and special clubs. You'll then be added to a directory of fellow students and alumni, making it easier to keep in touch after graduation. If you didn't get along with everyone on campus, don't worry – if you receive a message from someone you don't already follow, you'll have the option to decline it, as you can with regular Instagram direct messages. Instagram is currently testing School Communities with a handful of US colleges, but hopes to roll it out more widely in the coming weeks.